This week, the M P Varshney High Voltage Laboratory was dedicated at the Zakir Husain College of Engineering and Technology, Aligarh Muslim University. Professor (Dr.) M P Varshney, an alumnus of this University during 1942-46 has graciously made a large donation for the extension of the High Voltage Laboratory, named after him. It's been said, "The electrical department of this college boasts of the best high voltage laboratory in the entire north India. This is but one of several excellent high voltage laboratories in India. There's a Design Idea in EDN magazine that uses just one IC in a simple, high voltage power supply. See the June 26, 2008 issue. It's a fixed output supply with limited adjustment capability. If you need a small, inexpensive power supply, this is a good possibility. The output voltage can be increased by adding more secondaries, and stacking them up, as in the design as shown. The regulation is not great, but if that is all you need, then that is ok. However, if you prefer better regulation, and if you don't need a floating output, then the circuit would work better if the voltage feedback was taken from the output (with a voltage divider) rather than from a separate secondary winding. Our design had worked for 20 years in the field, then suddenly last year we had failures. My gut reaction was counterfeiting, even though I had never experienced it before, and this was without even laying a CRO probe on the circuit. A month ago, our RF engineer and I looked into it, wondering what was wrong with the design. After a week of bench tests and simulations we went back to basics. We measured the VCEO and found the problem! When I etched the metal from some samples, we found a tiny die on the faulty parts. 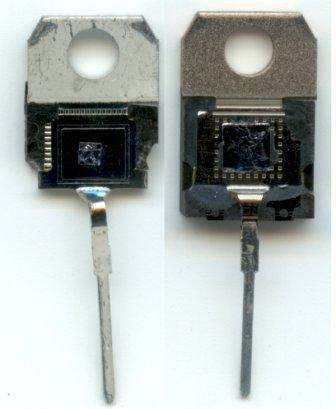 This occurred with ST BU505's and some ON Semiconductor MJE8502's, though these are obsolete. 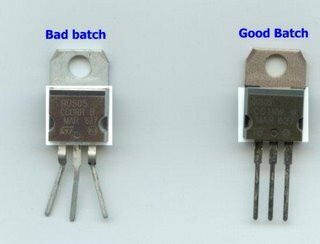 It is likely this won’t affect many, but we have good evidence of counterfeit high voltage transistors from some suppliers. The types so far affected are BU505 and MJE8502. These are 1500V VCES and 700V VCEO. We noted failures in our products and traced to a very low VCEO which I checked with a current limited voltage source. We found ST brand BU505’s failing at slightly more than 500V VCEO and the same for ON Semiconductor branded MJE8502. I etched a couple of BU505’s with nitric acid to remove all metal. One was a good tested one and one the other a failed one. There was a completely different die size between the two. The good one had a 3.3mm die and the bad one a 1.8mm die. The good one had the markings etched and the bad one had markings printed. 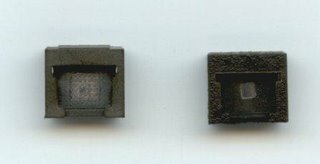 These devices are often used for switchmode supplies and horizontal drive in CRT’s, where circuit designs may not ever allow the base to be open circuit, i.e., driven from a low impedance source, so I guess that many users many not see the failures. I presented the data to St Microelectronics and they confirmed the likelihood of counterfeit devices. Now we will have to do incoming VCEO checks of all batches until the situation improves. We try to get these normally from mainstream suppliers, but sometimes supply problems prevent this. It looks like we will have to get smarter with purchasing though. This is the first time I have personally come across this in 20+ years of engineering.